At long last the indoor hopscotch is finished! Or at least, as finished as I'm planning to make it for now. Eventually I'd like to back it with denim, either yardage or thrifted jeans legs. 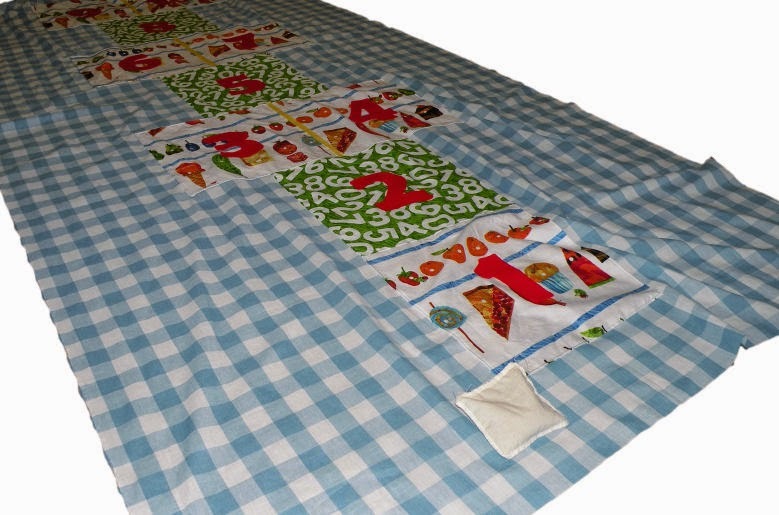 I figure that way it'll make a nice picnic blanket and hopscotch-on-the-grass. It didn't come off completely pucker-free, but the ones that snuck in aren't too noticeable...especially if you're actually hopping on it! It'll be a great way for Miss M to burn off some energy while the weather's still cold. We're eagerly waiting for Spring! There have been more and more birds in the area and the skunks and raccoons are coming out of hibernation. Still, nothing is green and it remains below freezing most days. I'm so glad to have this done. Although it was basically easy, delays (including a stint in the hospital!) made it feel like an unending project. I started to feel very resentful toward it which, of course, made me not want to sit down and deal with it making it go even longer. But at last it's done and I can move on! Little Guy needs some pajamas and I need to get to work on Miss M's flower girl dress so I can do mine and still have plenty of time for the bride's dress. What a great idea! I absolutely love your fabric choices, too - so happy. Thanks! It was one of those things that came into my head and I went to see what I had on hand to make it with. I'm very pleased with the outcome! 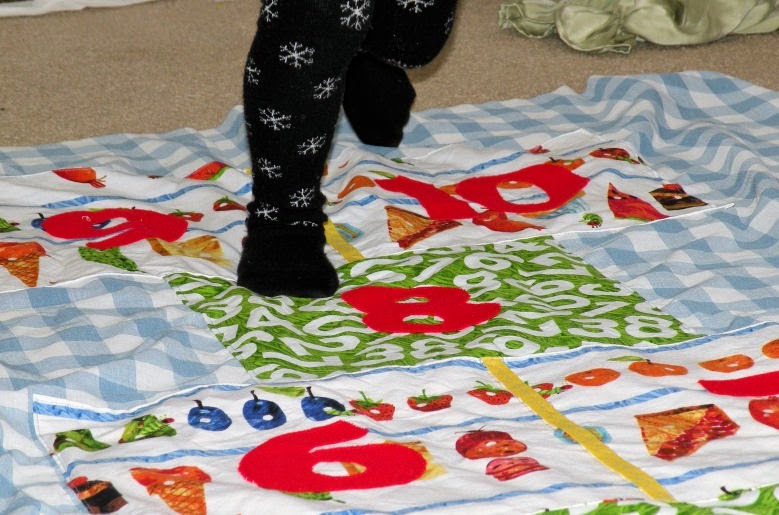 All the moreso because the Hungry Caterpillar fabric is all about counting, so hopscotch seemed appropriate.